Enjoy the Deluxe Li River Cruise departing in the early afternoon on a daily basis from Yangshuo (Xingping Pier) back to Guilin. For visitors staying overnight in Yangshuo there are also some Yangshuo (Xingping Pier) to Guilin one-way Li River Cruise options available to choose and book online. The Deluxe Li River Cruise (4 Star Boat) is the only deluxe Li River Cruise boat operating on a daily basis along this route. It's commonly referred to as the 'best boat available' (although that status is reserved for the Luxury Li River Cruise (4.5 Star Boat). There are 3 x choices of seats available for the Deluxe Li River Cruise (4 Star Boat). 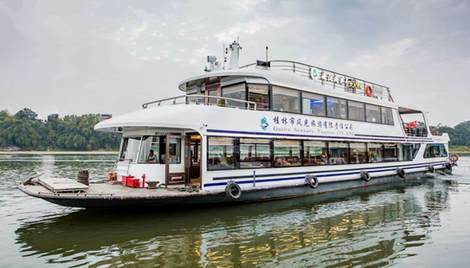 This boat departs in the afternoon from Yangshuo (Xingping Pier) to Guilin Pier, allowing visitors to take a Li River Cruise from Yangshuo to Guilin! ​The interior of the boat facilities and overall cleanliness are at a good level, with larger, comfortable seats as well as clean bathrooms. The number of person's on-board is approximately half the Superior 3-Star Boat Cruise and there isn't as much microphone usage on-board.